For international shipments, we use UPS - the United Parcel Service. Thus we can guarantee a quick and reliable service to destinations all over the world. 3-5 business days delivery - all over the world! Wherever you are, your parcel will always be in the hands of only one shipping carrier, no delays due to changing services, less handling processes, quick (UPS internal) customs handling. All this adds to an additional safety of your parcel during transport. Shipping charges for international orders are calculated automatically during the order process; based on the total weight of the merchandize ordered. Multiple items will be added together, thus the total weight of your order will be the basis to calculate your shipping costs. No extra costs for packaging material or handling. Shipping within Germany and the European Union is free. This will be a UPS standard parcel or a DHL standard parcel (small items DHL large letter). We always chose the quickest available service depending on the delivery addresss. For small and light-weight items we offer this service. The shipping costs are quite low and delivery is fairly quick, approximately one week, maybe some more days; worldwide shipping possible. Please note that this service has no insurance cover and cannot be tracked. This is a fast UPS shipping service, a registered and insured parcel. Cost-effective and reliable quick shipping. Highly detailed tracking - parcel status can be checked at any time. Any delays, be it customs or other causes for delay, are automatically reported to your email-address, you will always have the latest information on the parcel status. Any delays are automatically reported to your email-address, you will always have the latest information on the parcel status. Any delays, be it customs or other causes for delay are automatically reported to your email-address, you will always have the latest information on the parcel status. Only applicable for shipments outside the European Union. All items in this online-shop will be shipped from Germany. Therefore, any order shipped to a destination outside the EU will be subject to import tariffs when the parcel arrives. Merchandise sold to buyers from outside the EU will be priced free of VAT / German value added tax. The recipient of the parcel will be responsible for the import of the merchandise and the applicable fees / tariffs on arrival of the parcel. These vary in each country; your local customs office will be glad to help you with the current status of import regulations. Please check the shipping services overview for import facilitation and savings with certain shipping services. 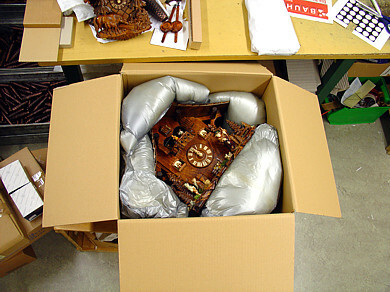 We make great efforts to organize the shipping of your order as safely and quickly as possible. Shipping services to world-wide destinations are very expensive. Therefore, we only charge the actual shipping costs we have – no handling fee is charged for your order. 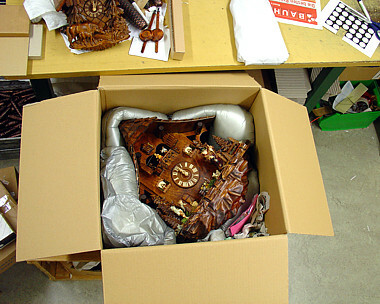 Nevertheless, many of our products are very fragile and need extremely careful wrapping and packaging. We have an elaborate packing machine to guarantee a packing as safe as possible. 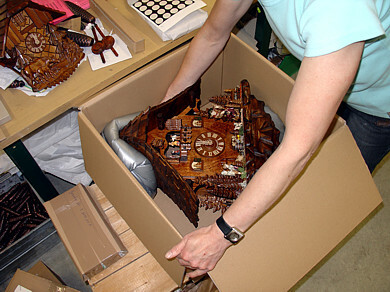 We use a two component foam system, which allows for an exactly shaped wrapping of the items. The warm and liquid foam expands as soon as the two foam components are mixed. While inflating, the foam shapes itself around the product. Cooling down, the foam hardens and keeps the product exactly in place. It is nevertheless still soft enough to allow for a cushioning of the items inside the parcel.